NASA on Mercury's Craters: "Anyone Else Think This Looks Like the Cookie Monster?" 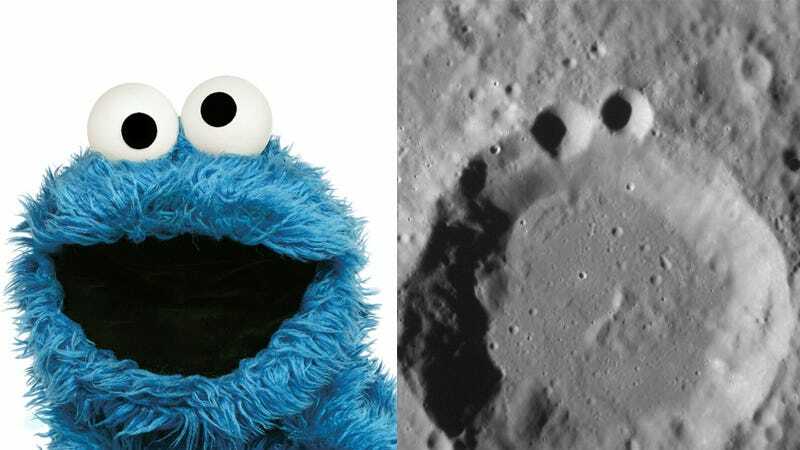 The Messenger spacecraft has photographed some neat craters on Mercury's surface and NASA thinks they look like the cookie monster. What kind of magic cookies are you eating, NASA? Hmmm, wait. I think they are right. Anyone Else Think This Looks Like the Cookie Monster? Ok, so maybe it's just me. But the superposition of younger craters on older craters (in this case two smaller craters upon the rim of an older crater) can result in landforms that appear to resemble more familiar shapes to human eyes." It's not just you, NASA. Don't worry, it's all ok. You may be reading too much Gizmodo and watching too much Sesame Street, but all is fine. And guess what: Sesame Street agrees too!